Bending Machine - Sunrise Fluid Power Inc.
Cylinder force 40 Tons 75 Tons. 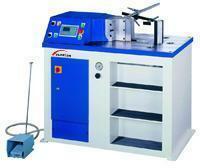 Pipe bending range (90° bend)* Ø3 / 8" ~ Ø2" Ø3 / 8" ~ Ø2"
Excellent repeatability of cylinder stroke accurate to ±0.05mm. Easy to learn programmable control. Name brand electric and hydraulic components ensure reliability of entire machine.